short girl, long island. : Raw Fruit + Nut Bites. I am the worst when it comes to posting recipes. There are enough recipes strewn around my room to assemble a cookbook [not to mention an obnoxious amount of food pictures on my iPhone], but they never make it to the 'net. Well, I decided to go through the recipes, recreate them + start sharing them. This girl = total sucker for snacks. Instead of sitting at the table + enjoying a meal, I usually eat standing up [a habit I developed during high school marching band that I can't seem to break it] or in my car [not a morning person, so eating on the go is crucial so i'm not a total crankypants]. Any food that can be prepped in advance, taken on the run + not make a mess is my favorite. 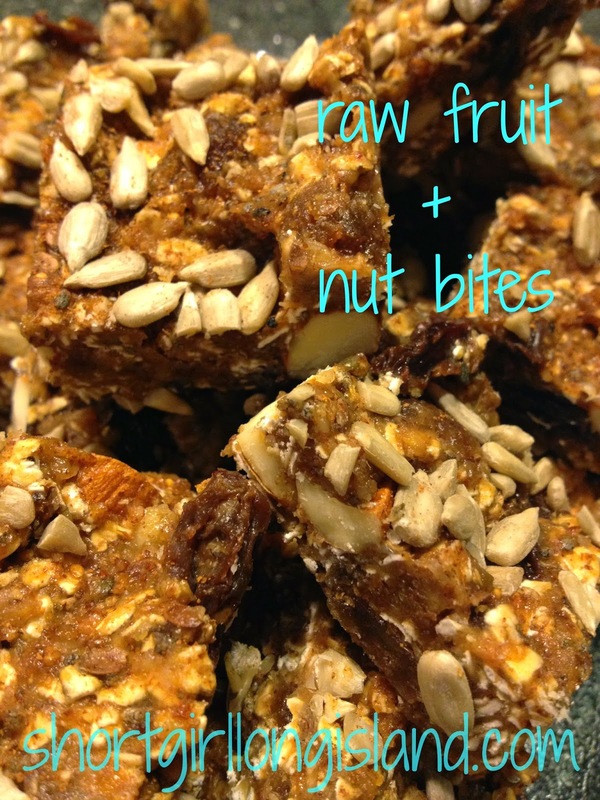 These raw fruit + nut bites are an awesome snack that definitely keeps me from eating junk, plus help keep my sweet tooth in check. First things first: put your raisins in a small glass dish, sprinkle them with the cinnamon + add hot water. Stir + let them sit for at least fifteen minutes - you can work on the rest of the recipe while you wait. Since I used whole almonds, I tossed mine into my Vitamix + let them pop around a bit, just to break them into pieces. Put almond butter, chopped almonds, figs, dried apricots + the banana into a blender. Pulse until the ingredients are incorporated - it doesn't have to be smooth. Transfer to a large glass bowl. Drain the raisins, but don't rinse - you want some of the cinnamon to stick to the raisins. Prep your glass dish for the bites with wax paper, while you're at it. Add rolled oats, coconut oil, chia seeds, flax seeds and hemp seeds + mix gently with clean hands [its like grandma's meatballs - your hands are the best tool for this trick]. The raisins shouldn't be too hot, but if you feel that they are, wait a few minutes to mix it all up. Once the ingredients are mixed + the oats are coated, transfer to the glass dish with the wax paper. Pat down the mixture so its evenly distributed. Sprinkle sunflower seeds on top + gently press them down with the palm of your hand, so they don't come off when you cut the bites up. Place the glass dish in the freezer for an hour or two, so they can harden up. When you're ready, remove the block of goodness + cut into bites! The size of the bites is totally up to you. These usually keep well for 3-5 days in the fridge, but I keep most of them in the freezer + defrost a handful the night before work. If you try the recipe, let me know what you think! I can't edit the post at the moment, but if you want, sprinkle a tiny bit of sea salt on top before serving. Looks like a great, healthy recipe! Thank you, I'm glad I found it.